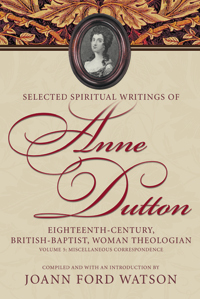 This collection of the miscellaneous correspondence of Anne Dutton illustrates her address to diverse audience on a wide variety of topics. She engaged in theological debate on such topics as Sabellianism in her letter on the self-existence of Jesus Christ. She also engaged in debate against Mr. Sandeman on the issue of antinomianism. She offered spiritual encouragement and advice on many topics to relatives and friends. Highlights include excerpts from her letters in her spiritual magazine, Divine and Moral Miscellanies in Prose and Verse (1762–1763), as well as her letters to the African-American converts in the American colonies (1742). Her letter on the doctrine of sin entitled, Hurt that Sin Doth to Believers (1743), shows the depth of her insight into sin and its consequences for the holy life.